Discover a variety of gems from Russia’s works of modern art at this specialist gallery in Moscow. The New Tretyakov Gallery is an institution dedicated to 20th-century Russian art. View the diverse collection of art here; it will give you an excellent insight into the many genres from the period. Admire seminal works by influential artists including Kazimir Malevich and Wassily Kandinsky. The gallery is part of the wider Tretyakov Gallery organization, which has several premises in Moscow. The founder was Pavel Tretyakov, a businessman who gifted his artwork collection to Moscow in 1892. The New Tretyakov Gallery on Krymsky Val has been exhibiting pieces since 1986. Examine some of the 170,000 pieces in the museum’s possession. To enter the gallery, look for the Central House of Artists in Fallen Monument Park. The gallery is located in a huge modern box-like building in the park. Notice the interesting examples of Communist-era sculptures in the Fallen Monument Park en route. Inside the gallery, discover works of 20th-century art from the Russian avant-garde. This is a great opportunity to see works from some of the pioneers of abstract art. Here, find Kandinsky’s riotous Composition VII, one of his most famous works, and Malevich’s moody Black Suprematic Square. Explore socialist realism, the official art form of the Soviet Union that celebrated the hardworking Communist. These works highlight the state’s ethos and help document this particular era of Russian history. As you examine the artworks, pay special attention to the representations of men and women living the socialist dream. Males are frequently depicted with rippling muscles and are hard at work in the fields, while females toil on the farm. Contrast these with the work of artists who contravened the official style, which is much more ambiguous than the straightforward mainstream Soviet art. See more recent examples of cutting-edge Russian art from the later decades of the 20th century, which help show the evolution of modern art. The New Tetrayakov Museum is located near the Park Kultury metro station. The gallery has an admission fee and is open Tuesday to Sunday. Visit the most iconic square in Russia, which is bordered by many of the city’s most famous landmarks. Rent skates, cycle or stroll in this vast green leisure park, a popular and well-equipped recreational space. Search for rare flowers and exotic plants in these renowned gardens, which provide relaxing respite from the bustle of central Moscow. This stunning park has great historical significance, symbolizing the Russian triumph over Nazi Germany. This monument is a stark reminder of Russia’s long history of power and perseverance in its military endeavors. A centerpiece of the Russian arts scene, this theater’s magnificent auditorium and top-tier productions will impress even the most jaded theatergoer. See great and small creatures at Russia’s largest zoo, which can entertain both children and adults for many hours. Enjoy relief from Moscow’s high-energy city streets in this peaceful public park, a popular spot for strolls and rest stops. A symbol of historical change, this cathedral was dynamited by the Soviets, only to be reconstructed following the collapse of the USSR. Take a walk through many different eras of Russian history at this expansive museum on Red Square. This distinctive monument depicts one of Russia’s most famous leaders and prompts extreme reactions among both locals and tourists. Mingle with locals in a square that is famous for associations with both poet Alexander Pushkin and a fast-food chain. Find one of the world’s largest and most incredible collections of both impressionist and post-impressionist painters in this Moscow gallery. A linchpin in Russia’s media services and a spectacular sight with even more spectacular views, this tower is worth a visit. Mourners and curious visitors stream to the grave to see the embalmed Vladimir Lenin, the famous revolutionary and one-time leader of the Soviet Union. Pay homage to Russia’s brave cosmonauts at this staggering monument, which commemorates the nation’s space race exploits. Relax in one of Moscow’s prettiest parks and attend one of the numerous cultural events that are hosted in this historic location. Discover the thrills of the space race at this unique museum, which honors the courage of Russian cosmonauts. Visit one of Moscow’s oldest and most revered museums and discover more about Russian royal life and military history. Visit the tombs of influential historical figures in this fittingly grand cathedral and learn more about their lives and deaths. Discover Russian history, architectural splendor and artistic accomplishments at the Kremlin’s longest-standing church. Overlooking the other religious buildings on Cathedral Square, this bell tower stands out with its size, striking design and historical significance. Marvel at the artistic achievement of these two gargantuan objects, which dominate Ivanovskaya Square in Moscow’s Kremlin. Discover the history behind this iconic Red Square statue, which was erected to celebrate a 1612 victory over Polish forces. Enter the hallowed ground in central Moscow where some of Russia’s most respected thinkers are buried. Set in a prime location in the heart of the city, this magnificent suspension bridge lights up the Moscow night sky after dark. This important city cathedral is known for its illustrious royal history and beautiful architecture. Another stunning religious building in the Kremlin, this church stands out from others with its unique artifacts and impressive icon collection. This gate is known for its distinctive architecture and provides an excellent entry point to Red Square. Once a summer estate frequented by Russian royalty, this popular park complex now contains museums, churches and other attractions. See the city of Moscow in all its glory from this great lookout point, where the vista includes many magnificent sights. This salmon-and-white Russian Orthodox Church is a faithful replica of an earlier cathedral, which was blown up during Communist rule. Think of Russia and you probably picture this iconic building, whose onion-shaped domes overlook the Moscow skyline. Located in Yakimanka, this hotel is within 1 mi (2 km) of New Tretyakov Gallery - Museum of Modern Art and Moscow Kremlin. St. Basil's Cathedral and Red Square are also within 2 mi (3 km). Polyanka Station is 9 minutes by foot and Oktyabrskaya Station - Kaluzhsko-Rizhskaya Line is 11 minutes. 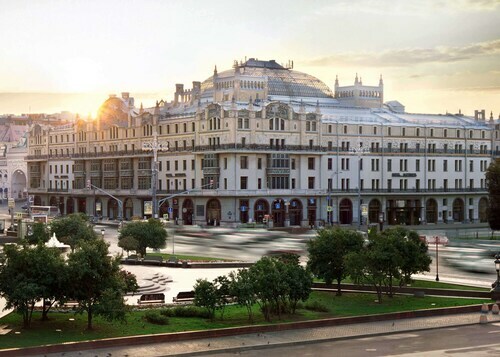 Golden Ring Hotel is in close proximity to the Arbat District, within 5 minutes' walking distance from Smolenskaya subway station, and within 1.5 kilometers from Red Square and the Kremlin. 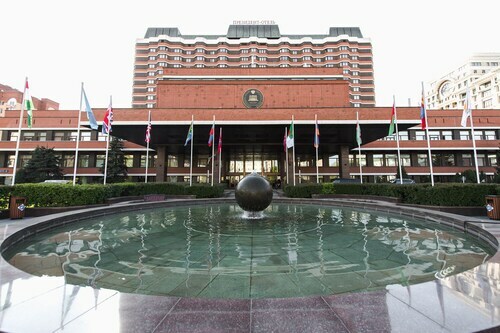 Located in Moscow City Centre, this luxury hotel is within 1 mi (2 km) of Zaryadye Park, Moscow Kremlin, and St. Basil's Cathedral. Red Square and Bolshoi Theatre are also within 2 mi (3 km). Novokuznetskaya Station is 12 minutes by foot and Tretyakovskaya Station is 16 minutes. Located in Moscow City Centre, this luxury hotel is within a 10-minute walk of Zaryadye Park and Moscow Kremlin. St. Basil's Cathedral and Red Square are also within 1 mi (2 km). Novokuznetskaya Station is 8 minutes by foot and Tretyakovskaya Station is 13 minutes. The historic landmark hotel stands in the center of Moscow across from Red Square and the Kremlin, and walking distance from St. Bazil's Cathedral, the Bolshoi Theater, Pushkin Museum, TSUM, and GUM. 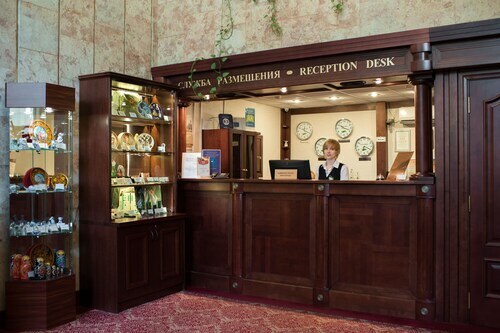 Located in Yakimanka, this hotel is within 2 mi (3 km) of State Tretyakov Gallery, Moscow Kremlin, and St. Basil's Cathedral. Red Square and Kremlin Armoury Museum are also within 2 mi (3 km). Polyanka Station is only a 4-minute walk and Oktyabrskaya Station - Kaluzhsko-Rizhskaya Line is 13 minutes. 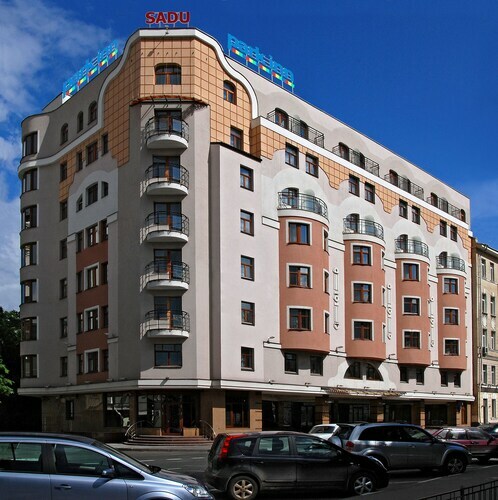 Located in Khamovniki, this hotel is 0.5 mi (0.9 km) from Cathedral of Christ the Savior and 1.8 mi (2.9 km) from Red Square. Kropotkinskaya Station is 9 minutes by foot and Park Kultury Station is 10 minutes.